We offer a time-proven, industry-leading product portfolio. We offer a multi-tiered workflow that integrates preventive tests (SecureAssist), which quickly analyze code early in the development process and comprehensive tests (Coverity), which weed out defects across the entire SDLC. Helps effectively and efficiently “shrink” security problems to a manageable size by reducing the infinite pile of misuse cases to those that matter the most. An innovative binary scanner that addresses third-party software vulnerabilities. Continues to be one of the most broadly adopted IAST solutions, providing a wide range of language coverage and good SDLC integration. Get the testing capacity you need, at the depth you need, to rapidly respond to changing testing requirements and evolving threats—without having to scale the cost. 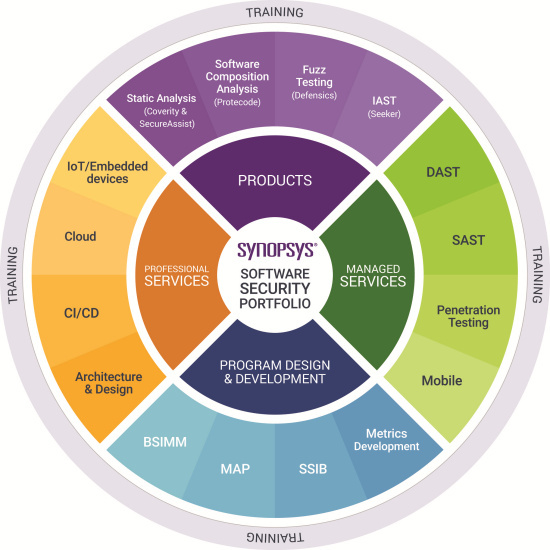 Combine traditional static and dynamic testing techniques to discover vulnerabilities, malicious, or potentially risky actions. Address your unique security and quality needs with specialized consulting by skilled experts. Identify software defects through analysis of access vectors including communication, client and server. Our experts draw on experiences working with hundreds of organizations to help you define, implement, and measure a software security initiative (SSI) to reflect your evolving development and deployment environments. Prepares developers and security professionals to build security and quality into their software development process and remediate found vulnerabilities and defects. Hands-on, technically rich training experience delivered on your own premises or virtually. Learn secure coding best practices as you code.